I purchased some dusky blue yarn before deciding that I wanted the Baby Blanket to be off white. 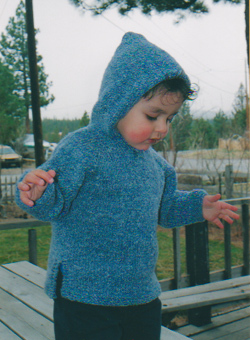 I used this blue yarn to make my first baby sweater. I learned so much while making this sweater – it was halfway through its production that I learned about Combined Knitting – poor sweater! – it was knit and unraveled so many times as I was trying to figure out the best way to make it. 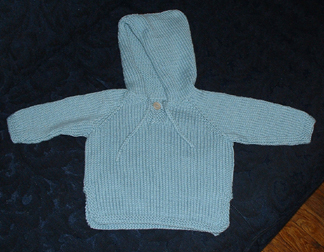 Pattern: The design is by Knitting Pure and Simple called Baby Tunic #211 (what a creative name!). I knit the 6 mos version. 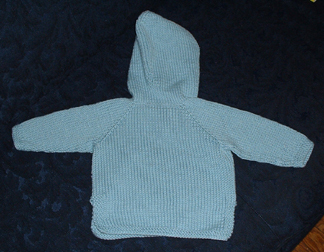 Yarn: I used the same Cascade Sierra yarn as for the baby blanket – 80% cotton, 20% wool – in a dusky blue. Compared to the white, the blue is much softer and its plies separate much more readily – I guess they came out differently as a result ofthe dying process. Comments: The best part about the pattern of this sweater is that it’s knit practically in one piece without many seams. You start at the neckline and work down, shaping the front, back, and sleeves all at the same time. Then, you pick up stitches at the neck to make the hood. Lastly, you use previously saved stitches to make the sleeves. The entire item is in stockinette stitch, except small detailing, which is in garter. A simple crocheted drawstring finishes off the project. If I ever try this pattern again (but why? There are so many out there, that there’s hardly a reason to repeat any knitting twice), there are two things I would change – 1. use bulkier yarn and smaller needles so that I knit comfortably, and 2. use a variegated or heathery yarn because st st knit in a smooth, silky yarn is just so, so unforgiving when it comes to imperfections. the sweater dimensions came out in accord with the designer’s – 20″ chest, 11.5″ length. Final cost of materials: about $20. Time to complete: about 2 weeks. Was it worth it? (1=why did I ever bother?, 5=the best thing I’ve ever made): 4. I learned how stitches shape a garment, how to pick up stitches, kitchener stitch, and it was overall a pretty good experience. At first, I wasn’t thrilled with my results, but the sweater really settled after I washed it, so I gave it to the intended recipients. They seemed to like it, and the mom mentioned that she wants me to teach her to knit sometime!